Spontaneous ideas are the best, and this one will be no exception 🙂 and it is called Norway in a Nutshell! 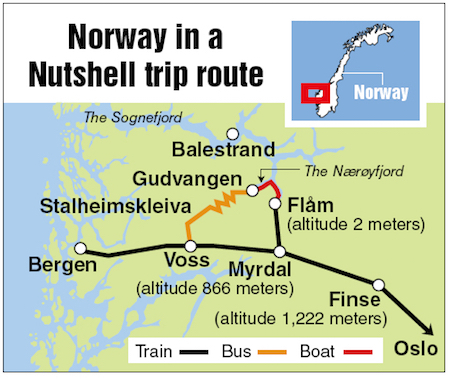 Booked only yesterday afternoon, is a trip through some of Norway’s most beautiful fjord scenery! Obviously the idea started off with the Tesla needing a road trip 🙂 and from one thing came another. Two days to experience the scenic Bergen Railway, the breathtaking Flåm Railway, the Aurlandsfjord, the narrow Nærøyfjord and the steep hairpin bends of Stalheimskleiva, and…the weather is fantastic!! This entry was posted on Saturday, June 27th, 2015 at 07:51	and is filed under Blog Entries. You can follow any responses to this entry through the RSS 2.0 feed. You can leave a response, or trackback from your own site.